The combination of our popular ‘Waterless’ hand cleaner and deep scrubbing fine polybead grains gives an added abrasive power for the removal of heavy grease and grime from the hands. 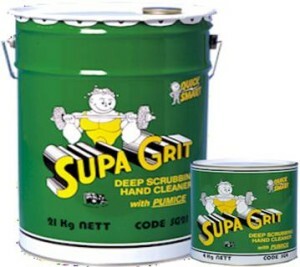 Supa Grit effectively removes deeply embedded grease, oil, bitumen, paint, etc. It is Ideal for use in heavy industrial applications. Contains lanolin.